Kyoto’s status as the home city of traditional ryokan-style hospitality is well known, and the local traditions exert a strong influence even in “Western-style” luxury hotels. The Celestine Kyoto Gion is unmistakably a contemporary luxury hotel, and while the name may not be well known outside of Japan, it’s the flagship product of an experienced hospitality group; the Celestine hotels, here and in Tokyo, are on par with the luxury hotels operated by the big international groups. What sets this particular Celestine apart is the way it seamlessly integrates the look and feel of modern luxury hospitality with the tranquility and ease of ryokan life. The setting is urban, but only just, with the Kamo river on one side and Mount Higashi on the other, and with several historic and cultural sites within walking distance. 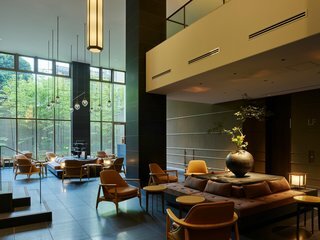 The soaring stone-clad double-height lobby, with its floor-to-ceiling windows and curvaceous modern furniture, sets an impressively stylish tone. The rooms, meanwhile, split the difference between modern luxury and tatami tradition — you’re instructed to remove your shoes at the threshold, in case you’re not already in the habit. And the restaurant, while not strictly a ryokan-style kaiseki, is a piece of history all the same; housed in its own separate classically-styled building is the new iteration of Yasaka Endo, a Kyoto institution for over a hundred years.